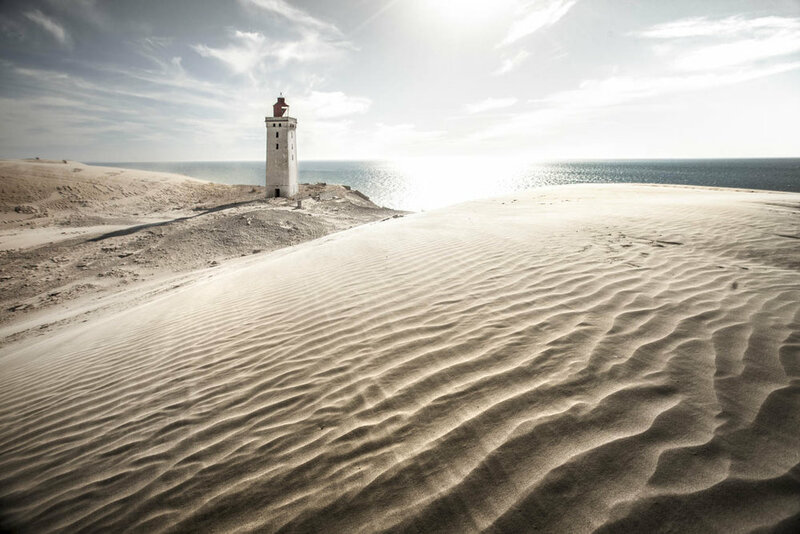 Some time ago, I have visited Denmark to witness both its fascinating nature and its amazing long, sandy beaches which you can read all about in my previous blog post '5 highlights not to miss in Denmark' The Lighthouse at Rubjerg Knude was one of those unique places highlighted in that blog, it had been on my travel wishlist for quite some time... I was not only great to have the chance to visit the place, the story behind it, immediately drew my attention and was one that inspired me to share my experience within this blog. The 23-metre lighthouse was built in the year 1899 and is situated in an area called Rubjerg, which is found in the region of North Jutland. 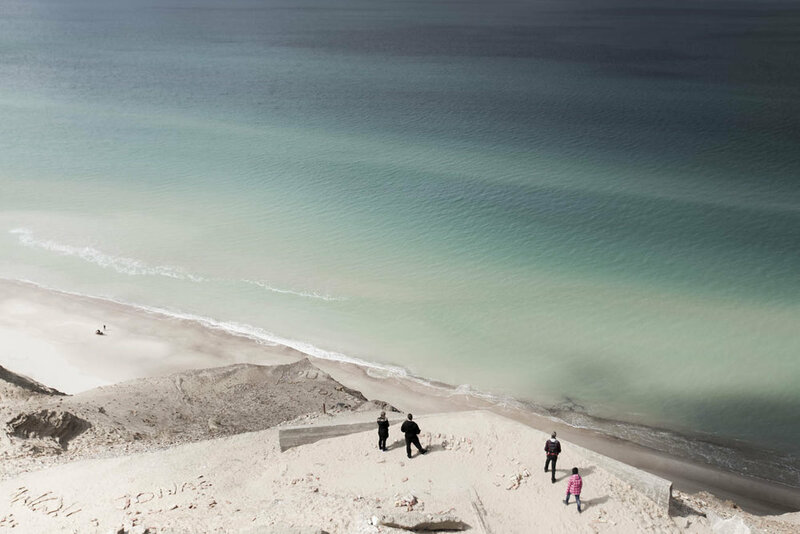 This elegant lighthouse is perched right on the edge of the (exposed) North sea coast and is positioned at the top of the LÃ¸nstrup Klint (cliff), which rises an incredible 60 metres (200 ft) above sea level. Until 1908, the lighthouse operated on gas, which was produced from a small gasworks, found on the site itself. After 60 years of being self-sufficient and taking its power supply from nearby, the gasworks ceased operating in 1968 and the energy supply was no more. When the lighthouse was first constructed, it was positioned 200 metres further inland; and there were actually no large dunes around it. As a result, the lighthouse became somewhat sheltered, but the light (once lit) could be still seen some 42 kilometres away. Over time the power of the sea, together with the onset of coastal erosion began to play a significant role in shaping what we see today. The wind changes the landscape in a dramatic way. Not a day is the same here. As the sea began to slowly erode away the land along the cliffs. Simultaneously, the wind began to blow large amounts of sand up from the cliff itself. This meant that the sand soon piled up in front and all around the lighthouse and as the dunes only grew much larger, the sand soon got so high that it was impossible to see the light out at sea. Unfortunately, on August 1st, 1968 the struggle against the elements was finally given up and the lighthouse was lit for the very last time. When visiting this â€˜picture perfectâ€™ location, you will now need to park some distance away from the lighthouse itself and then walk down a narrow, winding path that leads you to the main sight. This walk is really pleasant and it usually takes around 20 minutes. The lighthouse is visible throughout and the walk leads you through some outstanding natural dunes, that surrounds the whole area. Once you enter the sand dunes, they are spectacular in every way and you will definitely not be disappointed. With a great range of flora and fauna. Personally, it was a great experience and one I have never seen before. On arrival, it felt more like you are entering and exploring one of the worlds desert landscapes. Especially, as during my visit, the number of other visitors was rather sporadic and the dunes seemed sparsely populated, creating a great sense of remoteness and solitude. Appearing there in front of me, the lighthouse stands in all its dominance, casting an eye-catching feature for miles around, that perhaps, not long from now, will be no more and swallowed by the sea. As you get closer, you will also find the bricks of what once used to be the additional adjoining buildings for the lighthouseâ€™s staff. For a number of years, the buildings were used as a museum and cafe, but continually shifting sands caused them to be abandoned and left to nature. In 2002 and by 2009, the small buildings were severely damaged by the pressure of the sand and were later removed only to be left as rubble on site. When you walk towards the end of the cliff next to the lighthouse, you can look right down as far as 60 meters to the beach and the sea far below. A fence is placed there for your safety since many people visit this place over the years. Both shifting grains of sand and coastal erosion are a serious problem in this area. The sea is eroding coast on average 1.5 metres (4.9 ft) a year and the wind now moves the sand with 15 to 20 meters (50 to 65 feet) a year. It is a powerful and ever-changing landscape. During my stay, I visited this place on three separate occasions. Each time it felt deserted and somewhat untouched. When I walked towards the lighthouse, I could feel the sand particles blowing against my skin, especially when climbing up to higher vantage points or when the landscape became more exposed. Here, the power of the wind was strong and you can immediately see how the landscape has changed dramatically due to the forces of mother nature. Stopping and thinking for a moment really made me realise just how quickly these shifting sand dunes, help to form and shape this ever-changing landscape here. So much so, that if you visited a few months later, it is fair to suggest the landscape would not remain the same, as it did on a previous visit. And over time its appearance would change quite significantly. With those thoughts in mind, I noticed a series of footsteps, trodden into the sand. That had been left by previous visitors. They quickly vanished as newly formed structures of curved lines were shaped and created by the power of the wind. I went into the Lighthouse since I couldnâ€™t wait to see the view from the top. Going up in the lighthouse is quite an experience. I climbed the perforated iron stairs, which were made by the architects to allow a visual connection between the towerâ€™s vertical spaces. It wasnâ€™t for the faint-hearted, as it seems a long way down, especially when you are looking towards the beach, some distance below. The wind can be quite strong, when passing the open windows and as you climb higher, it becomes even stronger, especially on the exposed top. You can hear the strong wind howling through the old interieur. Once at the top, the views are simply breathtaking. You can see for miles and you can literally see the sand being blown up, creating a mini sandstorm moving seamlessly across the dunes. The sea shows its clear blue colours and is most definitely the place to be to witness an amazing sunset! As I ventured down the stairs again to explore more of the dunes, it was getting long in the day and the sun was already beginning to set. It turned out I wasnâ€™t alone anymore. The other visitors just happened to help form a great way to see the ratio of size and scale of the dunes in my photos. In the meanwhile, the wind was starting to calm and all I can do was to sit and enjoy this perfect moment. Even more so knowing that the next time I visit, this could be completely different, or even gone. The people of Denmark leave nature it as it, respecting it to follow its own path. For me, that alone is pretty fascinating as we live in a world where everything is automated, structured and controlled. As a photographer and nature lover, this place is such a gem. Natures art, the silence you can feel there, the light, the shapes, the setting. I am completely in love with this place. If you ever want to go there, the lighthouse is expected to fall into the sea by 2023, so you better be quick to get the chance to see all of this for yourself. And I can tell youâ€¦ it is completely worth visiting! A special thanks to VisitDenmark and Landal GronhÃ¸j Strand, who made this visit possible. If you would like to explore this region yourself, I would recommend you to have a relaxing stay in this beuautiful part of Denmark. Perfect for children and situated near Rubjerg Knude and many other worth visiting places that this area has to offer. SIGN UP TO RECEIVE MY LATEST NEWS AND UPDATES!